Do you crave to feel the grass beneath your feet? Do you find that time where dusk barely turns to dark and then into dawn to be a sliver of magic? Do you want your fingers to drip red with strawberry juice? Do you want to breathe in the warm summer air and think of nothing else? Then we are one and the same. Friday marks midsommarafton in Sweden – Midsummer’s Eve – at which point I’ll be sitting with friends in Sweden, laughing, drinking aquavit, and eating boiled potatoes with dill. Midsummer is a celebration of light, an embrace of the longest day of the year. I always think of change when it comes time for solstice, be it winter or summer. The change of seasons is visible, but sometimes these moments indicate less visible, inner change as well. We move from the drag of winter to the upbeat days of summer. We are energized. We come out of our emotional cave. We want to explore. We want to live. It’s at that time that I want to be sitting around a table celebrating my favorite day of the year. For midsummer is as much about celebrating light as it is about enjoying seasonal food, and that goes for wherever you are. In the last few weeks, my Saturday market runs in have taken on a whole new personality. The options are endless. The seasonal bounty is there for the taking. And I am happy to have it. In Sweden, strawberry is the queen of the food world right now. You would be hard pressed to find a midsummer celebration without it. 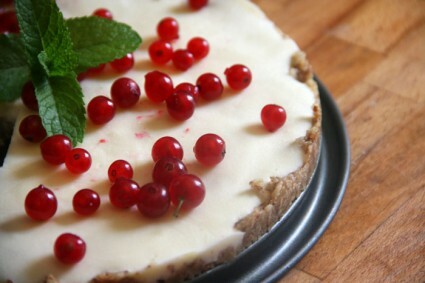 But at the market this week, I picked up a batch of red currants, and decided that they too would make for a good summer tart. This recipe was inspired by a variety of things. I have been wanting to use my basic almond + honey mixture as a base for something tasty, and this was the perfect opportunity. I came across a midsummer cake recipe on one of my favorite food blogs Green Kitchen Stories, and it too was made with a nut base. 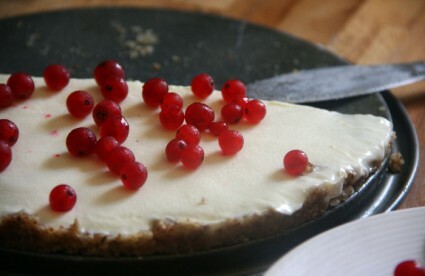 But instead of the usual whipped cream that’s common in Swedish summer desserts, they had employed yogurt. So I went for it, but wondered if maybe, just maybe, I could freeze the tart, making for some sort of home frozen yogurt tart. Experimenting is after all the only way you come up with good things. And as always, it would need a touch of olive oil, because I like a little savory with the sweet. The result is a tart that you don’t have to bake, and you can make ahead of time and take out of the freezer just a little bit before you want to serve it. I am calling it Summer Berry Tart, because it would be good with blueberries. Or strawberries. Or blackberries. Or raspberries. Anything that screams warmer days. I hope you make it and enjoy it with friends. Celebrate summer. Celebrate change. Celebrate living. In a food processor, grind the nuts until almost finely ground. You want there to be little pieces left, not a fine flour. You can also do this by finely chopping with a knife. Place the ground nuts in a bowl and add in the salt and mix together. Add in the honey, olive oil and water and mix together until a dough forms. It is easiest to work together the dough with your hands. Press the dough evenly into a 9-inch nonstick springform pan. In a bowl, mix together the yogurt, honey and olive oil. If you’re going to add vanilla bean, you’ll need less honey. And if you want a tarter taste you can keep the amount of honey low. Pour the filling on top of the crust in the pan. Place the pan in the freezer and freeze for at least two hours. 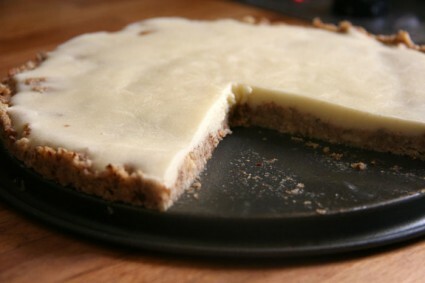 If you freeze the tart for longer, remove it from the freezer about 20-30 minutes before serving it. 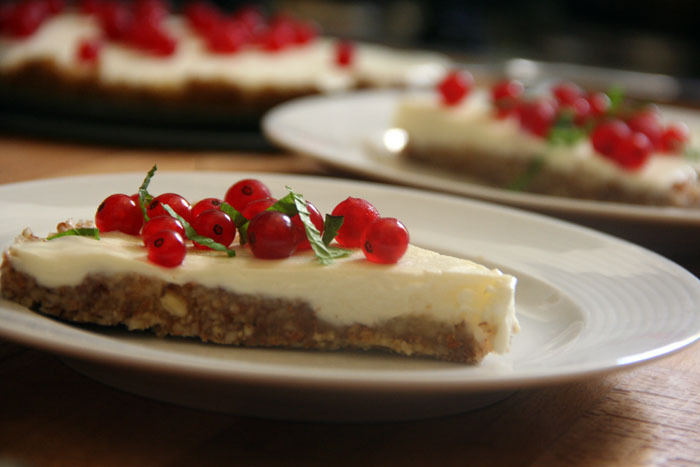 When you are ready to serve, sprinkle red currants and chopped mint on top. My young friend Molly emailed me this recipe & I signed up for your blog. I also posted the link on my blog. I love this recipe. I’m thinking of making it for a garden party but I think there might be someone with a nut allergy. Am I able to swap the nuts for ground up biscuits or would that make the recipe odd? Do it! You may need to tweak the amount, but I would love to hear how it turns out!